Neil Brownsword, Waster, 2011. Ceramic industrial archaeology, dimensions variable. Image courtesy the artist. Neil Brownsword’s ceramic installations present a socio-political commentary on the decline of the British ceramic industry in his home town of Stoke-on-Trent. The industrial area became a centre of ceramic production in the early seventeenth century because of the local availability of clay, lead, coal and salt. Adopting the role of both artist and archaeologist, Brownsword unearths discarded by-products from the closed Staffordshire potteries and uses these materials to create sculptures. His work reflects on the inevitable effects of global capitalism which continue to disrupt indigenous skills and a heritage economy rooted in North Staffordshire for nearly three centuries. Waster (2011) is comprised of detritus that Brownsword has salvaged from various shutdown ceramic factories in Stoke-on-Trent. 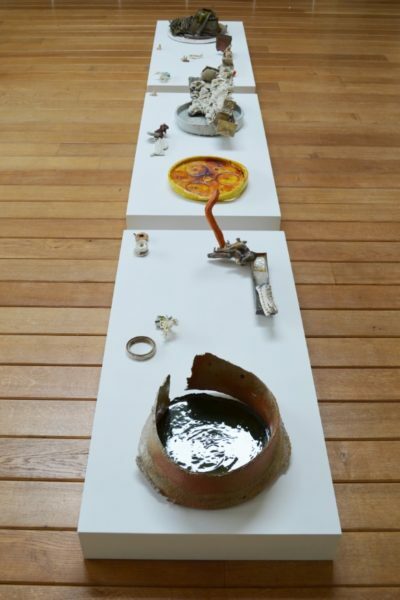 He has glazed and re-fired this material, fusing it together with ‘shraff’ or ceramic landfill, and has composed these transformed fragments into a sculpture that cite taxonomies of industrial archaeology. The title of the work directly references the term ‘waster’, which is used in this industry to describe a broken or ‘failed’ object which is subsequently discarded. It was the collections of The Potteries Museum & Art Gallery, based in Stoke-on-Trent, that specifically inspired Brownsword to make Waster. The Potteries has a renowned collection of Staffordshire ceramics and at the same time remains a key repository for the archaeology of the pottery industry in the region. The acquisition of Waster is an important update of the museum’s existing holdings, showing how ceramics and pottery have stretched into the contemporary realm. The acquisition of Brownsword’s installation also strengthens one of the museum’s collections priorities to support local artists with a link to the pottery industry. Neil Brownsword (b. 1970, Stoke-on-Trent, UK) trained at Josiah Wedgwood & Sons at the age of 16, and continued his studies at the University of Wales, Cardiff, and the Royal College of Art, London. He is Professor of Ceramics at Buckinghamshire New University and Bergen Academy of Art and Design. His PhD thesis, completed in 2006, combined historical and archaeological research on ceramic production in North Staffordshire from the eighteenth century to the present and the film archiving of craft skills in the industry today. Brownsword has exhibited both nationally and internationally, and was awarded with the prestigious Grand Prize at the 8th Gyeonngi International Ceramic Biennale, South Korea, in 2015.